The one year anniversary of Alibaba Group’s IPO, the largest in history at $25 billion, recently passed on September 19, 2015. Since its IPO, the company has been vigorously filing patent applications, and has amassed a portfolio of 184 US patents. Last year, in the months leading up to the company’s IPO, Envision IP identified 102 US patents and 302 pending US patent applications assigned to the company. Furthermore, Alibaba’s F-1 filing revealed that it had acquired a number of patents from Yahoo in 2013 for $70 million. The details of this acquisition are still not publicly available, and we could not find any assignment records at the USPTO which highlight the patents involved. Post-IPO, the company has made strides to further its US patent protection. Envision IP identified 184 US patents currently assigned to Alibaba, with 22 patents having been acquired from IBM. The remaining patents appear to be organically obtained; the result of the company’s own R&D efforts. 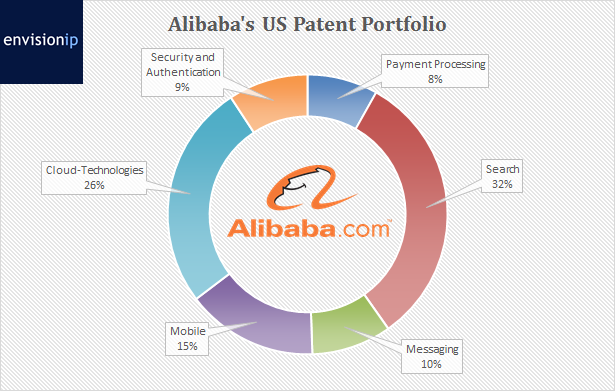 In addition, Alibaba owns 342 published, pending US patent applications. Interestingly, while the company was formed in 1999 in China, it did not begin filing US patent applications with regularity until 2006. The graph below shows the company’s US and Chinese patent application filing trends. From 1999 to 2008, the company filed only a handful of US patent applications. However, in 2009, it filed 61 applications (compared to 2 the year before), and has continued to file at a generally increasing annual rate since. Similarly, in China the company did not file any patent applications from 1999 to 2004, and had 5 Chinese filings in 2005. In 2006 however, it filed 100 Chinese patent applications. Alibaba experienced a surge in filings in 2011 with 417 filings, compared to 159 the year before. The rate of Chinese filings peaking at 522 in 2012. It is interesting to note that since the peak of filings in 2012, the Chinese application numbers appear to be declining, with only 77 filings in 2014. 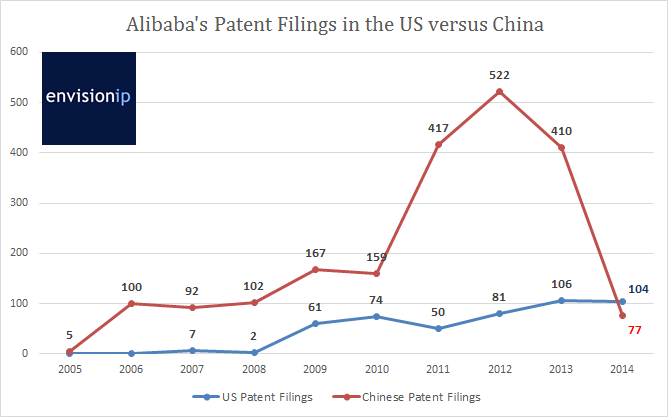 Conversely, Alibaba had over 100 US patent application filings in 2014. Both the US and Chinese patent offices publish patent applications 18 months after their earliest filing date. Thus, it will be interesting to see how the 2014 numbers flush out. 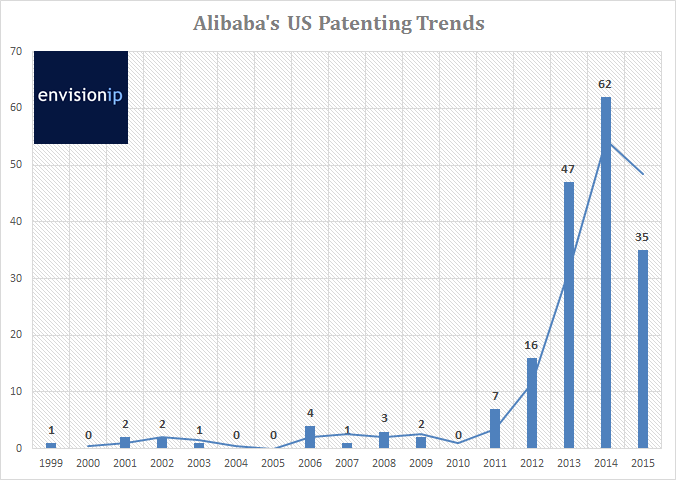 If the trend below continues, it may indicate Alibaba’s increasing priority to obtain US patents over Chinese patents. Regarding specific technologies in Alibaba’s US patent portfolio, the majority of patents relate to search engine and cloud computing technologies, with 32% and 26%, respectively. Other notable areas of patenting are mobile related technologies (15%), messaging and chat (10%), security and authentication (9%), and payment processing and web-based shopping/auctions (8%). Alibaba’s patenting efforts, at least for now, appear very focused on the company’s core e-commerce platform and related offerings. It does not appear to stray far from its business model, and the patent data does not reveal much about any possible disruptive technologies the company may be developing for the future. Contrast that with companies such as Google, Amazon, and Facebook, which are known for filing patent applications in areas such as drones, driverless vehicles, virtual and augmented reality, three-dimensional printing, and other technologies which have not yet become mainstream, and which are not directly tied to their core businesses. This is not to say, however, that Alibaba’s R&D group is not hard at work developing cutting edge technologies that may complement various business interests that the company has. For example, besides its online commerce platform, Alibaba has stakes in multimedia, video, and film (Alibaba Pictures, Youku Tudou, and Xia Mi), on-demand transportation and delivery (Cainiao Logistics and Alibaba’s investment in Lyft), and next generation payments, credit and loan technology (Ant Financial Services Group and 365fanyi.com). These areas of growth for Alibaba may prove to yield innovative technologies, and patents, outside of the company’s current core focus.